As the weather changed in October, Q and I cleaned up our house and sealed our windows in preparation for the cold winter. We left all but one bug behind…who we now, affectionately call Big Bug. Through the winter, Big Bug appeared crawling up our window plastic (yes, we have to put plastic on our windows to hold in the heat…don’t feel bad for us…we still live a blissful life) and around our plants. I would see him often and felt it was too cold to send him outside. I kept quiet about his living arrangement hoping that Q wouldn’t notice him. Sometime in January, Big Bug, showed up on our dining room floor. Unbeknownst to us, Big Bug could FLY. He’d never attempted a trip from the living room to any other section of the house (or so we knew). But, there he was beside my foot in the dining room with Q and I both staring in disbelief. I began preparing a Tupperware container for gentle transport of Big Bug into the outdoors when I felt the need to be honest with Q. “This bug has been here since October and I have not had the heart to put him outside.” Much to my surprise, Q came clean with his lack of action towards bug removal, admitting that he, too, had been watching Big Bug climb the living room window plastic for quite some time and had decided that he is not here to cause any harm. And so it was that Q and I decided to leave Big Bug alone as he tested out his (seemingly) new wings. A few days later, Big Bug showed up on the living room window plastic again and all was well with the world. Time passed, and I was cleaning the house in preparation to host a songwriter party. 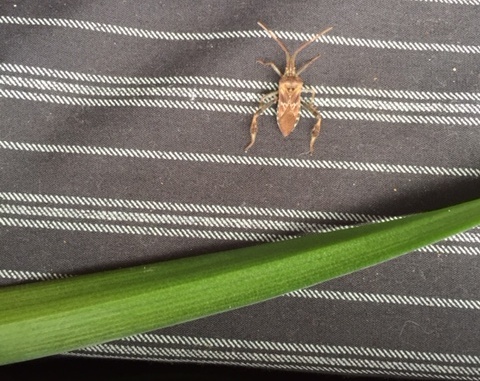 Big Bug hung out in our plants while I vacuumed and dusted. It finally came time to dust around the plants and there he was looking relaxed on the table. It took some time, but I made a decision that this was the day when I would send Big Bug on to new journey outside. I was worried about what my friends would think of my house keeping skills if they saw Big Bug. And so I Tupperwared him out the front door and sent him flying into a small pile of snow. Big Bug fell straight down, head first into the snow. I saw a small struggle with his back legs and then….nothing…no movement at all. I closed the door and returned to my cleaning with the image of Big Bug’s bum and hind legs sticking out of the snow. A few minutes later I realized I couldn’t let Big Bug die of hypothermia. And so, back into the Tupperware he went…this time with an inch of snow covering his head. I apologized to him and let him thaw on the kitchen counter. When I returned an hour later, he stood in a pool of melted snow, unable to move. “I’ve killed him!” I thought! But nope, unbelievably, Big Bug was just taking a rest. I nudged one of his little legs, and low and behold, Big Bug was still alive!! I put him back on his table with the plants and watched him slowly make his way towards the window plastic. Later that night, while my friends where here, I noticed that Big Bug had disappeared! I worried that someone might have seen him and removed him politely. They all claimed they had not seen him, but I had my doubts. Two days later, he showed up, chipper than ever on the plant table. Since that fateful night in the snow, Big Bug has had several near-death experiences. Last week-end, my Dad, his wife, and their cat visited. That Cat took one look at Big Bug and we could barely pry her little paws away from him. Q had to hold her back while I transported Big Bug to a safer location. I’m pretty sure we looked crazy to my Dad and his wife, but I can’t help but think this kind of life-saving behaviour was influenced by them. Our friend, Sandi was visiting on Sunday and, lucky for us, Big Bug was on the window plastic during the day and we were able to explain our shared living arrangement. Sandi wanted to sleep in our living room (so she could wake up with the Sun.) She told us she had nearly stepped on Big Bug in the middle of the night and was thankful she had previously been introduced. Whew. Another close call. I tried to take a picture of Big Bug for you today and he did NOT like the flash on my phone. But after enough chasing, he finally posed and gave me his best impression of a plant leaf.